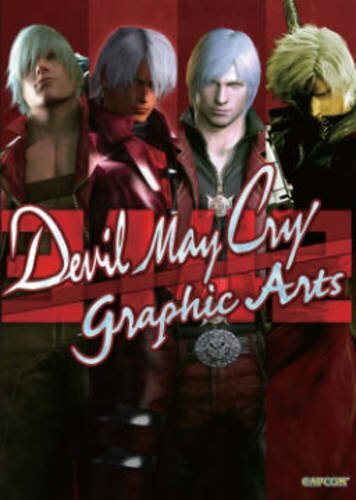 Devil May Cry: 3142 Graphic Arts is the companion for the Devil May Cry series that fans should not miss out. It was originally published in Japanese in 2013 and this English edition is translated by Udon Entertainment. It's a large format 224-page paperback artbook with low gloss pages. This book serves as a visual companion and artbook. The concept art comes in the form of character and creature designs and environment art. The arrangement of content follows the chronological order of the story.. It starts with the third game, followed by first, fourth and second. Hence the 3142 in the book title. DmC Devil May Cry that was released in 2013 is not in this book because there's already a dedicated artbook just for that game. The artworks in this book consists of game stills as well as hand drawn art. It's about 50-50 game stills versus illustrated art. The character cutouts from game stills are used in the character profiles with provided background. The sketches and coloured illustrations are accompanied by artist commentary. The fourth game features predominantly drawn art and that also happens to be the section that I like best. I prefer looking at the artist interpretation than at the stills which you already can see in the game. In additional to the art from specific games, there's also an extra chapter with art from guest artists. You'll get to see art from Ikeno (Darkstalkers), Hiroaki (King of Fighters) and many more. This chapter has more sketches, includes the line art, character model sheets, weapon design and art of cameo appearance. Downsides of the book would be the use of too many game stills for the first three games and the small print size of the environment art. For those who want to learn more about the game and staff, there are more than 20 pages of interviews at the back of the book. The interviews are with motion artists Tomoya Ohtsubo and Yuichiro Hiraki, modeler Sawaki Takeyasu, Jun Ikawa, character designer Daigo Ikeno, animation supervisor Hiroyuki Nara, writer Bingo Morihashi, illustrator Tatsuya Yoshikawa, director Hideaki Itsumo and producer Motohide Eshiro. Fans of Devil May Cry should not miss out on this book. Overall, it's well worth the money.